Flows are below 6K and the fly fishing on the Yellowstone River is great. Hoppers, PMDs, caddisflies, goldenstones, and yellow sallies have been the daily trout fare. Throw the dryfly, stick with it, and you will be rewarded. Nymphing and streamer fishing is as good as ever, both up on the banks and out in the middle. Flows against the cut banks are slowing and mid-river riffles are quickly dropping into shape. Wade fish or drift, either way will work. Our favorite bugs? X-caddis, parachutes, chubby chernobyls, PTs, hares ears, pat’s rubber legs, 20 incher stones, lightning bugs, and all sorts of sculpins. The Madison continues to provide. Hoppers, yellow sallies, PMDs, and king caddis are all on the menu. Tricos around early. The middle of the river has been treating us well, but look for a few big trout tucked in tight to the banks starting to look for hoppers. The Madison is fishing well top to bottom. Flows are prime for getting out of the boat and doing some wading. Look for fishing to continue to be great through August thanks to the completion of the Hebgen Dam project. Expect good flows and water temps to keep the bite going all summer long. Tricos have arrived. Daily hatches are thick. Head to the upper river for the best action. Bring your best reach cast. Lots of targets out there but fish to one, don’t group shoot. Set if you think its close. Fishing is good from the dam all the way to cascade. Nymphing along the grass edges continues to produce big numbers. Try a big attractor (crayfish, bugger, etc.) followed by a match the hatch nymph behind. Don’t let the grass scare you. The fish are there and on the feed. Look for hopper and ant action to only get better in the coming weeks. Smorgasbord out there but not much to say for the consistency of things. Seeing fair to good hatches but varies a lot day to day. Tiny midges, tricos, PMDs, sulphurs, and terrestrials are all in play on top. Nymphing for numbers continues to be good. We like small midges and 7x tippet for better hookup rates. Get out there early, the bugs are already there. The park is finally fully open to fly fishing as we have passed the annual July 15th opening of the Yellowstone River and there is almost no better place to be as a fly fisherman right now. 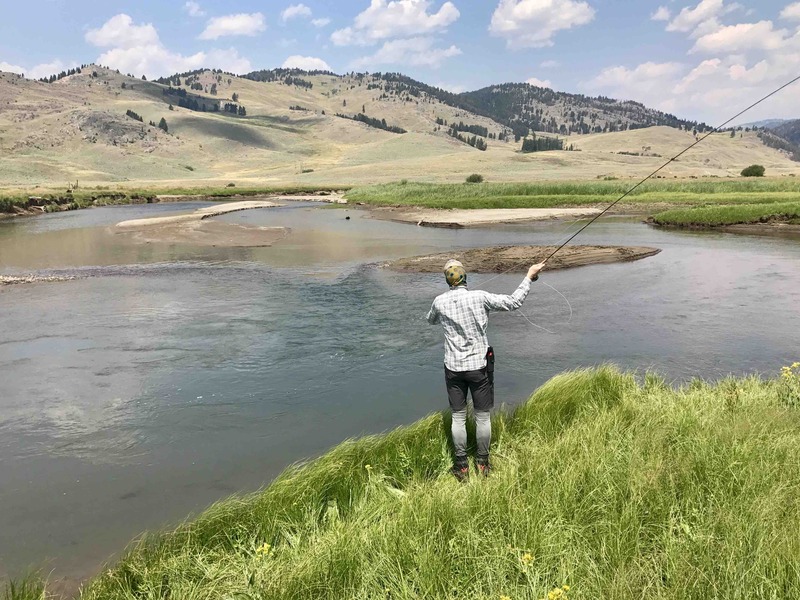 We have seen great hatches and equally great fishing across the Yellowstone River drainage: drakes on the Lamar and Soda Butte, PMDs on Slough creek, stoneflies still on the Yellowstone River, and terrestrials everywhere. We love fishing for native cutthroat trout. These rivers are chock full of ‘em. No better time than the present to get in on some cutty love!